So excited to be sharing this adorable Cinco de Mayo celebration with you! This year I wanted to create a cute and sweet table with a soft pink color combined with a variety of greens, I know it might not be the color scheme you are used to see on a Cinco de Mayo table, but it is fun to be creative and change things a little bit, right? I also have a little surprise for you... a DIY on how to make some adorable Cactus cupcake toppers! I want to start telling you about the gorgeous Saguaro! A few weeks ago I had the chance to talk to Nate from Nate the Great and ask him if he would be able to make a Saguaro out of balloons for me? He immediately loved the idea, and started working on my project! I am absolutley in love with what he created. THIS POST CONTAINS AFFILIATE LINKS. WHEN CLICKED AND YOU SHOP MY PARTY FINDS, I WILL RECEIVE A SMALL PERCENTAGE OF THE PURCHASE AT NO ADDITIONAL COST TO YOU. I THANK YOU FOR SUPPORTING BOTH MY BUSINESS & HOW-TO-GUIDES FOR STYLING EASY + MEMORABLE PARTIES. I also wanted to add some "Papel Picado" to my backdrop, along with the big Saguaro! My sweet friend Ana from JBalloon Fiesta was so sweet and custom made these beautiful banners in a "papel picado" style. Of course she made them to match my theme and my colors. Check out her etsy shop here to see more of her work. Now the yummy part of the party, the dessert table, my favorite for sure! I used a round green table that my friends over at Party at the Moon Tower carry. I laid over a colorful runner from Gracie and Lacie of Ship Party Return. I wanted to serve a drink that matched my colors, so I went ahead and prepared some pink lemonade and I served it on a cute drink dispenser with a barrel style. It’s no secret how much I love Mason Jars, so any opportunity that I have to use them, I will! I just had to dressed them up a little bit with some Mexican style! Once again I asked Ana to design and cut out these cute wrappers and also some small saguaro shapes that I later glued onto my pink and white straws. I ordered my cake from Dream Bakery Austin. I wanted a very simple and modern cake design and I loved the multi-colored green stripes, which helped me a lot by bringing all my different shades of green into one main focus point. As for the cake topper, a used a mini Piñata from J Balloon Fiesta. I also served some pink jelly beans inside a tall candy jar and some vanilla cupcakes. I dressed them up with these adorable DIY cactus cupcake toppers. More about these at the end of the post. For the guest’s table or should I say for my family, I used some cactus plates from Ship Party Return and I also used some wooden utensils wrapped with a cute tag from Ana. I think the table looked super cute and fun! Like I said at the beginning of my post, I am so excited to be sharing you with the first DIY project on my blog! I had the pleasure of working with Abby from Fete Gazette on creating this DIY exclusively for you! I've always admired everything she creates, she is so talented, so I am super excited to be taming up with her to bring you unique fun party DIYs. These adorable Cactus Topper are so easy to make and only require a few supplies. 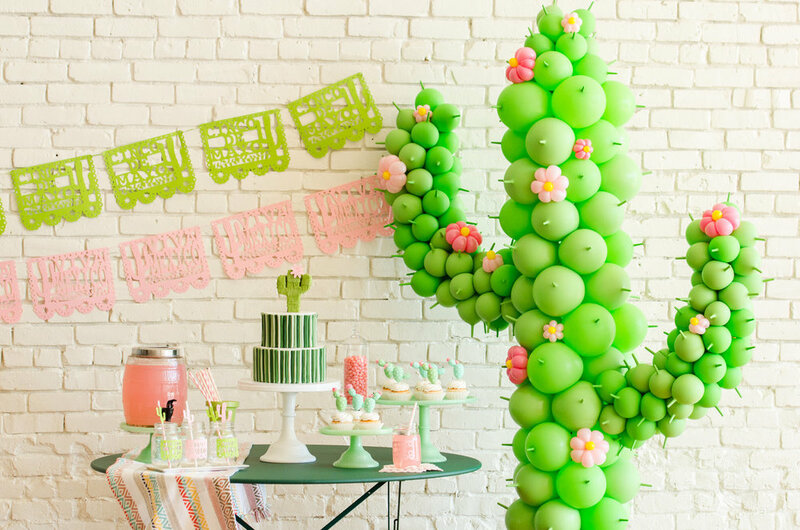 They’re Great for any Cinco de Mayo, Southwestern or Cactus themed parties. Please don't forget to sign up to our Newsletter to be one of the first ones to get the latest on party inspiration and free printables. By being a Mint Event Design's member you will be among the first to have access to my exclusive freebie library, only members can access with a specific password. You can find the link at the bottom of the page to subscribe or if you already have the password, you can go here to get the tutorial. Hope you liked my Cinco de Mayo party and see you all next week with more fun party ideas! You also can pin this one in case you are planning a party where these cuties can look pretty, but please don't forget to tag me on your photos... I would love to see and share your work!